If you do a Google search for "Kids bento" or a similar search on Pinterest you will see a ton of super cute bento style lunch ideas for kids. For months I have been oooohing and aaaahing over these and bookmarking my favorites for when the day came that my oldest, W, was in first grade and eating lunch at school. Maybe you have seen them? Sandwiches, vegetables and cheese cut into fun shapes, sometimes decorated with eyes, nose and mouth, etc - the possibilities seem endless. I have been holding onto an awesome Laptop Lunch Bento Box that my brother and sister-in-law had bought for him a few years ago anxiously waiting to use it and fill it up with fun lunches. 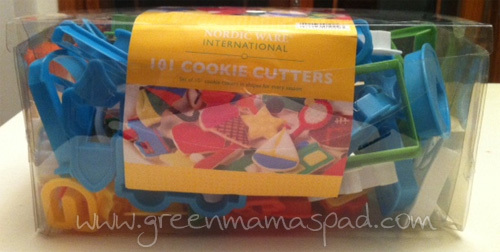 In preparation, last week I ran out to Target and got myself a box of 101 plastic cookie cutters and started thinking about what foods I wanted to include. After two days of cancelled school thanks to Irene flooding, power outages and road closures, we finally had the first day of school yesterday. So on Tuesday night I got all my supplies out and got started on my first ever bento box lunch. I wanted to keep it simple since this is new to me. Let me tell you, the moms who put together those awesome bento lunches for their kids are amazing because it took what seemed like forever for me to create mine and it is very basic. Seriously it probably took me an hour. 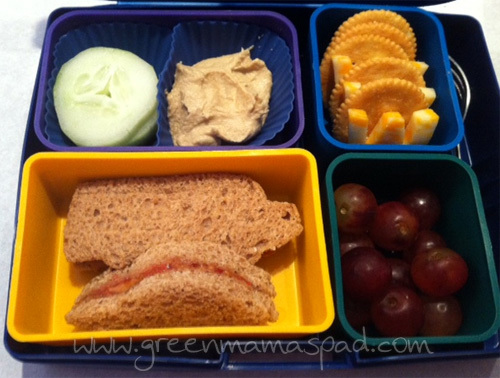 cucumbers, hummus, colby cheese & crackers, red grapes and car and school bus shaped pb&j sandwiches. You know what took me so long? Those darn cheese W's. Holy crap I wanted to poke my eyes out with toothpicks by the time I was done. So I slice the cheese into squares and press the W cookie cutter into them. Cuts through fine and now its time to get the cheese out. Yeah. The first one broke. The next 3 I had to ever so slowly and gently ease out. Once I got them done I vowed to never make letter shaped cheese again. He was so excited to use his new lunch box and he loved everything. See for me it looks so blah compared to everything I have seen out there but to my 6 year old, he thinks it is the coolest thing in the world. And that right there makes me feel great. He ate all of his lunch and do you know which part was his favorite? The W shaped cheese, of course. He already requested I make them again for Thursday. Shoot me. Do you make bento lunches for your kids? What are some of your favorite tools or things to make? Any advice for this bento newbie? These are super cute! I want to make them for myself! Thanks for the idea! I'm going to Google them now. You know I love Bento lunches! For the letters, I use the dull end of a toothpick OR the backside of an infant/toddler spoon to ease the cheese out. I have also have thought about sticking the cutter in the freezer to chill it first... it might release the cheese easier than if it is room temp. I'd probably eat a healthier lunch if I did this for myself. That is cool! I just do regular lunches, but would love to try it! So cute!! For those that don't have separate containers, you can use cupcake wrappers for different foods. Is that what you used from the cucumber/hummus? It looks great! That looks a lot better than anything I could ever make on a first effort... It looks amazing and I'm glad your son enjoyed it! I would eat so much healthier too if my lunches were like that! Would slightly freezing the cheese make them come out easier? Or run the cutters under warm water first so it comes off? Either way, it's adorable and your child must have loved it! Great lunch!! I love the cheese and crackers! Put a little olive oil - or any kind of oil like coconut or walnut or whatever you have - on the cookie cutters before you "cut the cheese". (Sorry I couldn't resist! :) ) Letters should be super easy then.